It may not feel like it this weekend, but spring is just around the corner! Spring is almost here, and this means the talented staff at Cincinnati Parks Krohn Conservatory (1501 Eden Park Dr. Cincinnati), located in majestic Eden Park, have once again outdone themselves creating the “fabulous foliage” floral show! 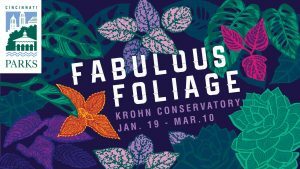 Fabulous Foliage will be on display Saturday Jan 19 through Sunday Mar 10. This beautiful show will be open Tuesday – Sunday from 10 a.m. – 5 p.m. (closed Mondays). Mixed with the traditional blossoming bulbs of tulips, hyacinths, and daffodils, the 2019 Spring Show will display thousands of brightly colored foliage plants! Not only do these vibrant plants make a statement on their own, but they also are planted in unique forms structures such as living walls, moss graffiti, and topiaries. Varieties of coleus, bromeliads, croton, grasses, and succulents are only some of the plants that will brighten up your spring all with their colorful leaves. Admission for adults is $4, youth (5-17) is $2 and children 4 and under are FREE! For more information, visit https://www.cincinnatiparks.com/krohn/.